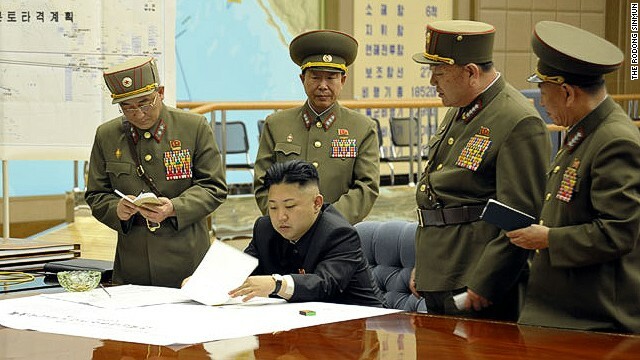 Kim Jong Un is briefed by his generals in this undated photo. On the wall is a map titled "Plan for the strategic forces to target mainland U.S."
North Korea launched three short-range guided missiles into the sea off the Korean Peninsula's east coast Saturday, South Korea's semi-official news agency Yonhap cited the South Korean Defense Ministry as saying. South Korea has beefed up monitoring on North Korea and is maintaining a high-level of readiness to deal with any risky developments, the ministry added, according to Yonhap. The Oklahoma state medical examiners is now saying there are at least 51 deaths so far. 20 of which are children. And they expect it to climb! Lol, i guess gary doesnt like art huh? "Hey Guys, I think I see a school of Tuna over to the right. @ TAofC, i wasnt shouting at anyone so mind your own business. Mary knows when im talking to her. TJI: 40 more confirmed dead, bringing total now at 91. And they are expecting more tornados in the next couple days! What a trajedy!